Here is a great discussion with the insightful, charming, and witty Phyllis Tickle! Join Ray and Phyllis as they discuss Phyllis’ most recent book, Emergence Christianity. Strap yourself in as Phyllis takes us on a whirlwind tour of 2000 years of Church history, demonstrating how seemingly unrelated events have worked together to generate the spiritual climate of the twenty-first century. You might just find that Phyllis is helping you to understand your own spiritual journey – I did! 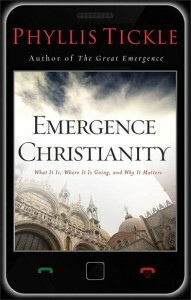 Make sure to visit PhyllisTickle.com and check out two truly helpful books, Emergence Christianity and The Great Emergence. Thank you Phyllis for taking the time to share your knowledge and passion with us! I listened to Phyllis Tickle a couple of times over the past days. I was quite fascinated by the podcast. As I look back at the fifty years of my Christian life, I see a similar patterns of change in my life just as Phyllis pointed out the 500 years changes observed in religion and society as a whole! I became a believer through Inter-Varsity Christian Fellowship…a fairly intellectual and Bible Study Based Ministry…then about 10 years later, moved into the Pentacostal , Holy Spirit focused movement, then about 5 years later became very involved with the Vineyard Signs and Wonders and Inner Healing ministry. Then spent a time of almost isolation due to circumstances where I discovered a more contemplative life enjoying many of the mystics. Now…through Free Believers and Beyond the Box I find myself being stretched once again by being called to reconsider much of my conservative and traditional views of God, the Bible and Eschatology! Another step forward! When will it ever end…or will it ever end this side of heaven?? I love it by it sure keeps me sitting on the edge of your roller coaster! THanks for all the challenges!